You may notice that the Workbooks and Keys for this curriculum are now named by color (“Purple Workbook”) rather than by year (“Year 1”). That’s to help you understand that you can use these workbooks in any order. It’s a four-year cycle but the books can be done in any order. The Core Instructor Text still provides the instructions for all four years. If you have one of the older copies that says “Workbook 1” instead of “Purple Workbook,” don’t worry; the content is still the same. The Purple Workbook, along with the accompanying Key and the Core Instructor Text, make up Grammar for the Well-Trained Mind: a complete course that takes students from basic definitions (“A noun is the name of a person, place, thing, or idea”) through advanced sentence structure and analysis—all the grammar skills needed to write and speak with eloquence and confidence. This innovative program combines the three essential elements of language learning: understanding and memorizing rules (prescriptive teaching), repeated exposure to examples of how those rules are used (descriptive instruction), and practice using those rules in exercises and in writing (practical experience). Each year, parents and teachers go through the dialogue, rules, and examples in the Core Instructor Text; students follow along in the Workbook. This repetition solidifies the concepts, definitions, and examples in the student’s mind. There are four Workbooks, one for each year. Each Workbook contains the same rules and examples—but four completely different sets of exercises and assignments, allowing students to develop a wide-ranging knowledge of how the rules and examples are put to use in writing. The Workbook comes with its own Key, providing not only answers, but also explanations for the parent/instructor, and guidance as to when the answers might be ambiguous (as, in English, they often are). All of the rules covered, along with the repeated examples for each, are assembled for ongoing reference in the Comprehensive Handbook of Rules. This will become the student’s indispensable guide to writing through high school, into college and beyond. Step-by-step instruction takes students from the most basic concepts through advanced grammatical concepts such as modal and hortative verbs and multiple functions of noun clauses. Extensive diagramming exercises reinforce the rules and help technical and visual learners to understand and use the English language effectively. Each step of the diagramming process is illustrated and thoroughly explained to the student. Text for examples and exercises are drawn from great works of literature, as well as from well-written nonfiction texts in science, mathematics, and the social sciences. Regular review is built into each year of work. The first of four sequential workbooks, each containing new exercises that allow students to practice and apply the grammar principles under study. When do the workbooks come out for years 2,3&4? Thanks! We plan to release Year 2 in Summer of 2018, with 3 and 4 coming out each year thereafter. What is the difference between these books and First Language Lessons? I just ordered Level 3 of FLL for my daughter. We have completed Levels 1 and 2 and love the format. So, I’m wondering if I missed something with these seemingly new editions? We also use Writing with Ease. You did the right thing! 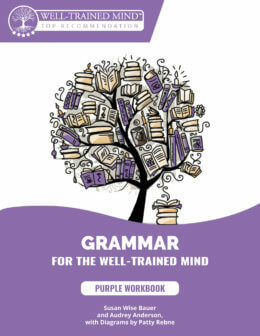 This series, “Grammar for the Well-Trained Mind,” is a follow-up to the FLL series. Your daughter will be ready for this after she completes FLL 3 and FLL 4. Is this geared for 9th grade ? It could be used by a middle-schooler or high-schooler. It would certainly be appropriate for 9th grade. Is it possible to get a sample of the workbook? What age/grade levels are they written for? These books are best used in the middle grades (5-8) but can easily be used by high-schoolers as well. Do the workbooks progress in difficulty? No, not really. Once all the workbooks are available, it will not matter what Workbook you start your instruction with, since each workbook will cover the exact same rules and examples. The exercises change in each workbook – but only in content, not in intensity. Each one can be used independently, at any time during the course of your study. Can a middle school student successfully complete this program little to no understanding of classical grammar? Yes! They could start with this with no prior experience/training.